Type of works: manufacture, supply and installation of 38 purpose-built cross passage and 425 commercial grade fire doors. This £3.5m contract saw Booth manufacture, supply and install 38 purpose-built cross passage and 425 commercial grade fire doors in tunnels along the Channel Tunnel Rail Link between the centre of London and the South Coast. 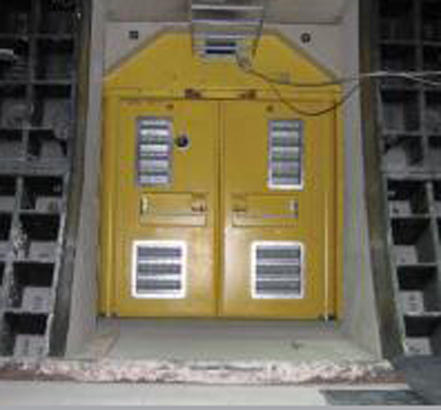 Booth Industries was employed to design and build 38 large, double-swing steel fire doors which provide access between the tunnel bores in times of an emergency. These doors not only had to withstand the effects of fire but also the excessive, fluctuating pressures exerted by high-speed trains. Included in the door package were 425 commercial fire doors for plant rooms and corridors in the tunnel ventilation shaft and head-houses located at various positions along the length of the link.